a blog on sparkly devops. Since I’m co-chairing the Devops track at Agile 2015 with Dominica DeGrandis, I figured I’d take the opportunity to meet more folks in the Washington DC area to see what kind of different challenges folks are facing with implementing Chef and Devops in general. One way I’m doing this is an open invite for early edition CoffeeOps. I’m also giving Chef Intermediate on August 10-11 and Chef Fundamentals on August 12-13. One thing that I really enjoy about Chef (the company) is that we make our training materials available to folks under a Creative Commons license that allows (even encourages) folks to share and adapt the content as long as appropriate credit and licensing is maintained. Every individual that does Chef training teaches a little bit differently in terms of style although the materials are exactly the same. The value in the training isn’t the materials, but the conversations, interactions and space that is created by the actual class. Every class is completely different because the people going to the training are completely different. Private trainings (trainings for specific companies) are really interesting because we can have really deep discussions about specific topics (depending on time) and it’s easier to get people in a collaborative mindset. My goals when training are to create a safe place for folks to learn, share and build connections. All of our trainings fall under the Chef community code of conduct. In Fundamentals, my goals are to help folks understand the core concepts of chef, read cookbooks confidentally with an eye towards identifying good and bad patterns, write cookbooks, and debug issues that occur through understanding what’s going on. In Intermediate, my goals are to help people to understand more about identifying good patterns in using chef through greater understanding of resources through writing lightweight resource and providers (LWRPs), additional debugging skills, and basic testing while in the process of leveling up ruby skills. How do you know whether you are ready for Intermediate training? Do you understand what happens when chef-client runs? Are you comfortable with your editor of choice and navigating the organization of a Chef cookbook? Do you have Chef DK installed on your workstation? A second thing that I really enjoy about Chef (the company) is the attention to diversity and inclusion measures. Earlier in the year we provided diversity scholarships to Chef Conf. Additionally, we regularly provide training scholarships. Confirmation that you can attend Fundamentals training on August 12-13, 2015 at the MicroTek in Washington DC with a functional laptop. If you are interested, but feel you don’t have the right skills please get in touch anyways. I will help you identify whether you are gauging your abilities correctly for this Fundamentals class, and also point you in the direction of resources that will help you get the right skills. One resource that is available to you right now is the Learn Chef site that will walk you through some of the initial concepts and prep your workstation to be ready for the class. I also have a sekret code “HELLO-CHEF” that will take 10% off both Chef Fundamentals and Chef Intermediate. ETA: Extra special code “WDC20” for 20% off both classes! The conference and training start early, so if you are an early person and are up for some CoffeeOps time in the DC area let me know! A few years ago I met Marius Ducea at Chromatic Coffee. Afterwards reflecting on the time that I spent, I felt more enthusiastic about my work in the industry due to Marius being awesome and the mental engagement outside of the everyday. Marius has been a key DevOpsDays Silicon Valley organizer for years and community builder within the Chef and DevOps community. His insight into a variety of current and future technology was interesting and educational. The conversation allowed me to see beyond the perceived value of my role based on the the technology and cultural mores of my company, that “ladder of prestige” present in some organizations that ranks Operations staff lower than Engineering (and “non-technical” roles lowest of all). Being in the middle of my company’s “ladder of prestige” led to a lot of pressure with little reward. I had been having problems seeing the value of the work I was doing or what impact it made. Talking to Marius gave me insight about what I was working on. It helped me recognize that I needed a change and that it was critical for my mental health to connect with a larger community of practitioners on a more regular basis. I envisioned creating a “hallway track” space with intra-company cooperation; affording individuals a place to meet together with no agenda, to connect and share in an undirected manner. Conferences have this informal hallway track; the conversations in conference corridors in between sessions and after hours. There are barriers to quality hallway track time: inclusiveness of the conference, costs of attendance and job flexibility. If a conference does not have a lot of diversity, and the attendees are very cliquish, this can lead to people feeling very isolated who aren’t already established in the community. Conferences that have a code of conduct and make other efforts to be inclusive can help facilitate individuals participating in the hallway track. Additionally costs of attendance and job flexibility, may make the hallway track unavailable to a majority of people in the industry. Any specific conference may only last for a few days, why wait a whole year to get the benefits of the “hallway track”? I sent out a tweet with a location, time and #coffeeops and showed up. The first few times, only one or two folks would show up. As time passed more people joined and interesting discussions like leveling up your skills were had. Years later, other folks have started up local coffeeops from Seattle, Washington to Sydney, Australia. I’ve changed jobs, and as a remote employee at Chef, it has become even more valuable to me as water cooler time; that time to take a break and remember to breathe. It’s also a place to share ideas in their nascent form allowing room for the ideas to grow to greatness through the contributions and challenges of the group. All of the folks attending CoffeeOps Santa Clara were critical in helping me shape my thoughts in the well-received “Hero to Zero” talk on burnout and ‘heroic’ behaviors in the workplace. Coffeeops is a way to generate your own hallway track, cross company cooperation and individual improvement. How do you start up a CoffeeOps? Should you start a CoffeeOps? How much community do you already have? Are there people looking for the same kind of outlet? Is there already something filling the gap? What is the density of people in your area? Do you have the time and energy to expend if this is completely new in your area? Be patient, it takes time to catch hold. It’s important to be welcoming, encouraging inclusivity as new people join. Talk about it. Ask for help. Use twitter and mailing lists. Pick a good environment for talking. When starting out don’t get too bogged down by formalities of rules and procedures. Code of Conduct is important. Any other aspect is open for discussion based on the group of people that come together. Some folks will make the decision to come based on an agenda. Others will be more likely to come if it’s more freeform as they deal with other obligations before heading over. Shout out to all the Slack CoffeeOps folks who helped me polish my thoughts here, and for the introduction to Ink Drop to help me in my quest for awesome ink. I purchased a set of 3 Uniball Jetstream RT 0.7 mm black ink in January of 2014. The first thing I noticed was the length of the pen was significantly shorter from the Safari that I’ve been using. It will take some time before I can tell whether this is actually a problem or just a difference. The ink definitely dries quickly. I can’t see how someone could smudge this unless the paper was somewhat wet already. On moleskin paper, it was more readily stuttering where ink seemed to stop. As a supporter of the spark notebook kickstarter, I’m eagerly looking forward to the “perfect” notebook. I find the act of writing notes much more helpful to organizing my thoughts than typing in to a computer most of the time. The challenge is finding the right combination of paper, pen, and ink. When everything is in balance, the flow of thoughts is seamless. There is no thoughts blocked as the pen dribbles, sticks, or stutters across the page. Ink flows in a seamless concert without the fear of smearing as I pause and withdraw inwards to reflect. When Kate Matsudaira blogged about the search for the perfect notebook it resonated with me for many reasons. The deconstruction of the problems of the many notebooks she examined illuminated an important process that I hadn’t thought through before especially around keeping track of what works, why, and how it could be better. I don’t think there is a “one” perfect notebook, but I think the spark notebook is perfect for organization of goals, time keeping and the “big” ideas in daily work life. When the spark notebook delivery email came out, I realized that I wanted to know more about the writing utensils people use and prefer to write with. I tweeted out and the twitterverse responded. Generally I try pens out and then forget what worked and didn’t. So I’m going to try out some of the suggestions and share my experiences. Back in April 2014 at Chef Conf, @isafarnik let me borrow his Lamy Safari. It flowed, was a great width for me in my hand and wrote nicely in my moleskin. I purchased the Lamy Safari Charcoal Fountain Pen (along with a second blue one) and it’s been my go to pen since then. I also have tried out different ink with the Lamy Safari Converter Z24 and Lamy Refills by Monteverde Rainbow Fountain Pen Cartridge . In the converter cartridge, I used Noodlers Polar Blue Eternal Ink . Pen is a great width for my hand. My handwriting is improved just from feeling like I’m writing with something substantial. The Lamy ink and the Noodlers Polar Blue ink are great colors. The ink can smear if touched right after, so if I pause or am writing too quickly – smudge. The ink bleeds through on most papers. I received the “perfect” notebook at a conference that did NOT which was amazing (yay for conference swag of good notebooks!). A notebook I got from a Google event has also been great. It works “ok” in moleskin notebooks. The Monteverde Rainbow ink has some not great colors. I should have figured out what maps to what, but for example the red wasn’t RED, and the color I’m currently trying out is a murky brown. Due to the first problem, I tend to write a bit differently filling in the top of the back and front of facing pages and then filling in below. I don’t really pay attention too much to the fact that I get ink all over me most of the time. I’ve noticed this with most pens. I noticed that my blue Lamy was more messy than the black pen. After examining the nib closely I think that there might actually be a defect in the nib. When I did some google searches which led me to A case of the Creeps. So it could be a mixmatch between the ink and the nib (which is why I purchased the different ink to try out). Essentially, I need to find a “less wet” ink to try out with the safari to see whether the experience changes. In future posts, I’ll take a look at the Unball JetStream, Bic Atlantis, PaperMate InkJoy, Uniball Signo 207, and Le Pens. When building from source to add new posts. For zsh issues for rake new_post. A little over seven years ago I was starting a new job. At the time I was 3 years into a health journey and had a goal of doing 25 hikes in 1 year. In 2009, I hiked my longest single day hike of 14 miles across two parks. Over time being the single point of failure at work meant that I was not able to spend weekends hiking. Somewhere along the way, job stress combined with appendicitis and complications from surgery led to a state of low energy, high pain and not a lot of positive fueling activities. In 2014, I joined Chef. All of a sudden some of the barriers that were in place fell away. Admittedly some of these were self imposed based on my own (high) expectations of my work. I started physical therapy and celebrated being able to walk further month by month. For the last 3 weeks I have been on vacation and taking advantage of it in part by getting back into hiking. Each year for the last few years I’ve set a reading goal on Goodreads that I have accomplished, this year I’m bringing back my hiking goals! Rather than setting a number of hikes, my goal is to be able to hike 15 miles in a single day by December 2015. Today George, Brian and myself went on our first hike of 2015 at The Forest of Nisene Marks State Park which is a few miles north of Aptos. It was relatively short as I’m still sore from the last hike of 2014. Even though I’ve lived in the Bay area for years, until this past December I’ve never gone to this park. It’s about an hour away from home and actually has a nicer area to walk with your dog than Henry Cowell. There are not great bathroom facilities here so not a great park for young families and long trips. The toilet at the trail head is enclosed in a small dark, dank building with the corpses of hundreds of flies on sticky paper hanging over your head. Paths are also not well marked. Lower areas allow dogs on leashes but past the “Winter Gate” dogs are only allowed on the fire road. Some of the trails cross the creek, and the expectation is to cross logs or rocks or wade. Second growth redwoods line the road past the locked “Winter Gate”. There are also some eucalyptus trees. The creek burbles along to the side. Mary Easton Picnic area is very quiet with lots of picnic tables and another small dark less dank toilet stop. We didn’t see most of the items on this checklist but we did see Oyster mushrooms! Apparently there is a yearly Fungus Fair coming up next weekend where you can learn about the different fungi in the forest. We did see quite a bit of English Ivy which appears to be an invasive species. 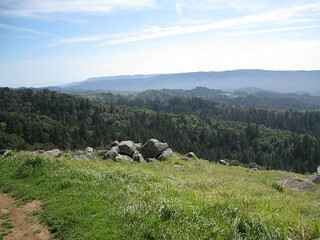 Later this year we hope to hike up to the 1989 Loma Prieta Earthquake epicenter. This is in a no-dog area part of the park so it will have to be a no-dog hiking day. Overall this was a great adventure. I can easily see us coming back multiple times as I build back my stamina. There are short and long hikes with a wide range of experiences. The Aptos Creek Fire Road between the Steel Bridge to the Mary Easton Picnic area is mostly flat with a small bit of elevation towards the end. Past this area there is a gate that marks where dogs aren’t allowed (and they aren’t allowed on the Porter Trail or the West Ridge Trail). The Terrace Trail, and Oak Ridge Trail both have a small bit of elevation. While our hike was short, there is so much more for us to do here including hiking all the way out to the Soquel Demonstration State forest. I’m really glad that my current job allows for me to even consider the idea of working towards this goal for myself. With the additional travel for clients and conferences there is potential for me to explore other areas as well. I am privileged to live in an area that continues to develop additional trails and parks to explore. I’m looking forward to finding out about other places that have trails to explore. If you have recommendations for your favorite areas to hike please do share!